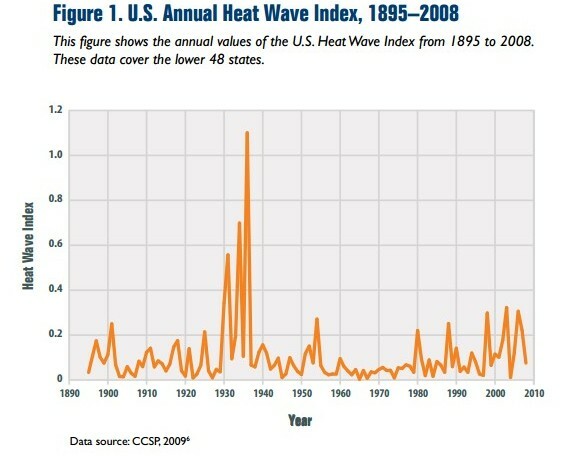 Heat waves occurred with high frequency in the 1930s, and these remain the most severe heat waves in the U.S. historical record (see Figure 1). On September 23 through 26, representatives of the world’s Environment Ministries will meet in Stockholm to agree on the final draft of a key portion of the latest Intergovernmental Panel on Climate Change (IPCC) Summary for Policymakers gospel which is expected, once again, to keep the political climate cauldron steaming. This Fifth Assessment Report (AR5) is intended to be used by international ministers working to devise a new global treaty by 2015 to curb “climate change”. lately…not so much. Therein lies the big rub. How can ministers conjure up a newsworthy sequel to previous knuckle-biting prognostications when all evidence suggests that the prophesies, and the scriptures they were based upon, were proven wrong? Remember that really scary “hockey stick” graph IPCC used to show that rising atmospheric CO2 concentrations would send global temperatures soaring? 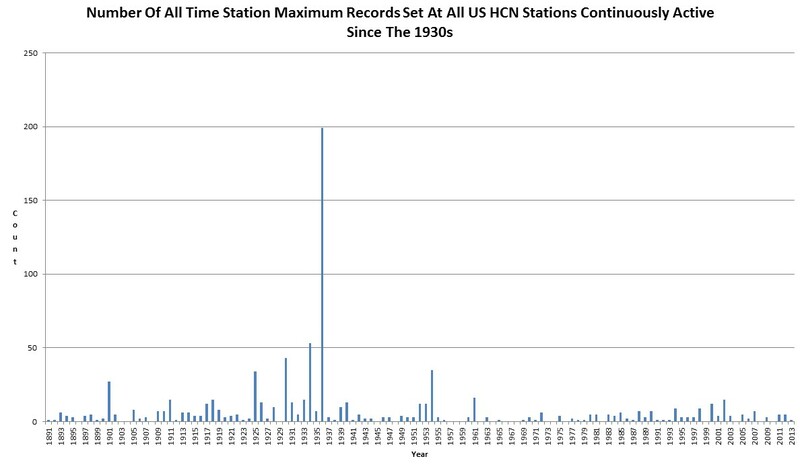 And recall all the ballyhoo about CO2 levels reaching a 400 ppm record high? Yet last February even IPCC’s chairman Rajenda Pachuri has admitted that world temperature data has been flat for the past 17 years. And that was after the British media reported that the UK Met Office was projecting a 20-year standstill in global warming by 2017. One highly plausible answer to this mystery is that the climate models upon which IPCC’s failed projections are based exaggerate climate sensitivity to CO2, underestimate known natural forcings, and simply don’t understand how to factor in and calibrate other influences such as ocean cycles and solar activity. Numerous recent scientific papers suggest that overestimation of sensitivity by at least 30% may account for much of the problem. If so, a reduction of 30% would leave lots of missing heat which must have been offset by natural cooling. After all, the importance of those natural influences shouldn’t be that surprising given that history shows that temperatures have been higher when CO2 levels were lower, and vise versa. In fact, the past century has witnessedtwo generally accepted periods of warming The first occurred between 1900 and 1945. Since CO2 levels were relatively low then compared with now, and didn’t change much, they couldn’t have been the cause before 1950. The second possible very small warming, following a slight cool-down, may have begun in the late 1970s lasting until 1998, a strong Pacific Ocean El Niño year. Yet even if global temperatures actually did rise very slightly during that second period, the U.K. Hadley Center and U.S. NOAA balloon instrument analyses fail to show any evidence, whatsoever, of a human CO2 emission-influenced warming telltale “signature” in the upper troposphere over the equator as predicted by all IPCC global circulation models. In fact, about half of all estimated warming since 1900 occurred before the mid-1940s despite continuously rising CO2 levels since that time. So Maybe the Models Are Broke…Not the Climate After All! According to a recent Opinion & Comment piece titled “Overestimating global warming over the past 20 years” that appeared in Nature Climate Change, the model-based fear and loathing attached to global warming may be substantially overheated. Notably, Francis W. Zwiers, one of the three authors, is a vice-chair of this relevant section for AR5. The writers observe that whereas the global mean temperature over the past 20 years (1993-2012) rose at a rate of between about 0.14o–0.06oC per decade, average temperatures computed by 117 simulations of 37 climate models predicted a surface temperature rise of 0.30o-0.02o C per decade. The observed rate of warming was less than half of the simulated rate. 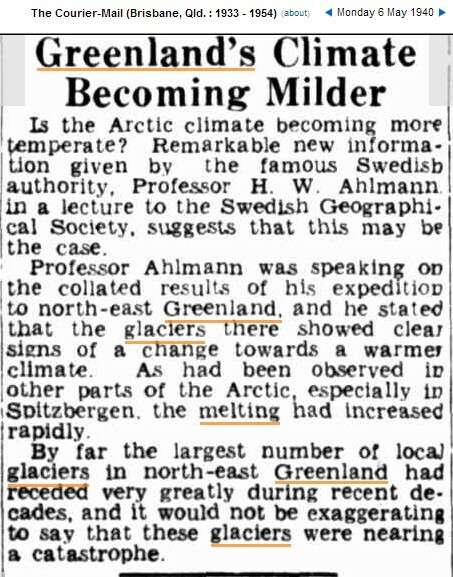 By far the largest number of local glaciers in north-east Greenland had receded very greatly during recent decades, and it would not be exaggerating to say that these glaciers were nearing a catastrophe.